The club are always looking for new members. If you wish to play come down and make yourself known to a club member and we will try to help with some basic coaching if needed. Everyone is welcome. The Beaumaris Bowling Club play at Happy Valley Beaumaris, this is a small recreation area set alongside the 13th century castle built by Edward the First. The castle is a World Heritage site. Looking towards the sea from the green a wonderful panorama unfolds, one of the most spectacular vistas to be found anywhere in the world; the Menai Straits between Anglesey and the mainland with the mountains of the Snowdonia range forming a backdrop. Bowling has been played at this location for over 100 years. The present club was reformed with its present constitution in 1977. Since then the club has become one of the most formidable in Wales. 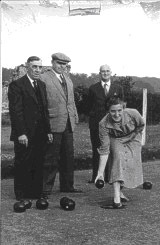 The game played in Beaumaris is the Crown Green version of bowling. TUESDAY AFTERNOON - SENIORS LEAGUE (two teams) Matches start at 2 pm. The 2015 season again sees both "A" and "B" teams competing in the competitive "A" division.